Marijuana training techniques such as pruning, shaping, and topping marijuana plants increases yield, make marijuana plants easier to work with, opens the plant canopy for better light absorption and give you more bud for the same amount of space. One day I was with another professional marijuana grower on a a visit to a wine vineyard. 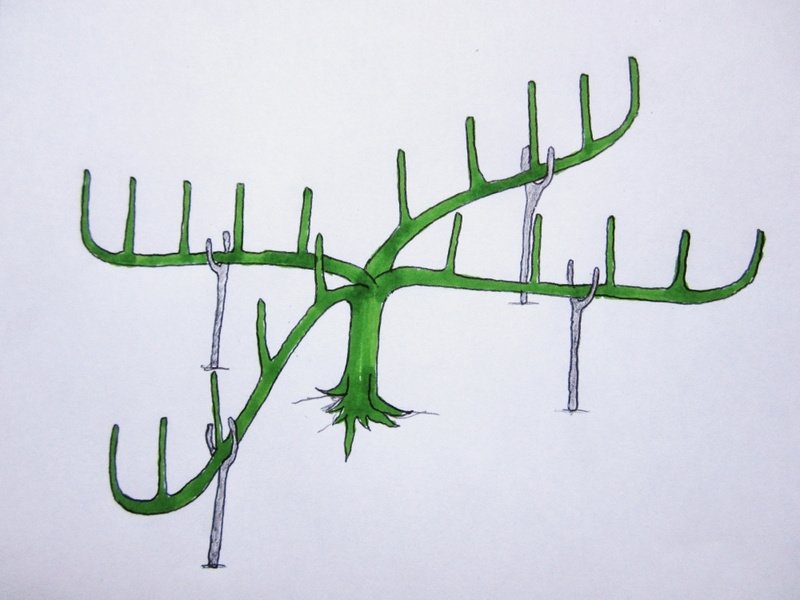 We saw vines trained onto a rack like a big X and realized this could be used as marijuana training techniques. We topped marijuana plants at about 3 weeks and created four distinct heads, each of which we began training downwards with plant ribbon looped over the branches and staked to the ground. This had to be done gradually, and the ribbons needed readjusting every few days. One cannabis plant split right in the middle of its stalk, dropping the branches straight to the ground. The branches now needed to be held up with forked sticks instead of tied down, but in the end the one that split was the most successful of these — it bent lower and more horizontal than any other. The end result was a plant with branches spread parallel to the ground nearly three feet across, but less than two feet high. As the buds developed and branches got heavier, we had to switch them from being tied down to being held up. 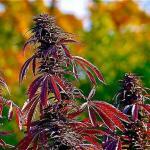 Due to the horizontal exposure of these methods, bud growth is very bountiful. Another marijuana training technique is to bend the marijana plant over and tie the top almost to the ground, making a graceful arch with the main stem. Before bending, any branch that would be aimed directly at the ground was pruned away, but most branches would gradually point themselves upwards towards the sun. We overcame the natural stress point where the main stem made the most dramatic bend by gently pinching and crushing the stem right when we made the bend. The trick was to crush the soft inside of the stem without breaking the outer skin. The stem would grow back with a dense knob, gnarled and hard like an old oak, right at the crucial point. Obviously, these training techniques are better suited to outdoors rather than indoor marijuana growing, but if you grow cannabis somewhere that has plant number limits, or you just want less hassle due to fewer plants, creative shaping and training can give you bigger yields and less marijuana plants to water. Be sure to check out the videos in this article so you can see marijuana training techniques.